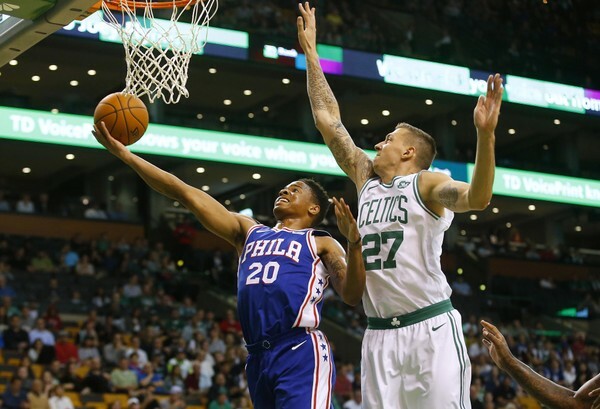 Daniel Theis played against fellow-Germans Dirk Nowitzki and Maxi Kleber last night, and Boston came away with the win versus the Dallas Mavericks. In the process, Daniel snared an NBA career-high 11 boards to go with seven points, two assists, two steals and a block. And he did all of this in just 17 minutes of court time. Theis is averaging 4.2 rebounds in 12.5 minutes on the floor. That computes to 11.9 boards per 36 minutes. His European numbers show 8.6 rebounds per 36 minutes. His two steals, two assists and a block in the 17 minutes against Dallas further show his value out there. Also, he is averaging 56.4% from the field, slightly better than his European accuracy of 52.6%. Daniel is adjusting very quickly to the American Professional game. Daniel Theis is another example of Boston's relentless search for hard-working, versatile players with the talent and determination to help win games. Oh, and by the way, his 11 boards against Dallas computes to 23.3 rebounds per 36 minutes. Those are Andre Drummond-type numbers. Pretty impressive.